Dynamite Entertainment continues to bring some of the best and freshest comic book projects originating at Kickstarter to print with the news that Blood Brothers, the supernatural pulp sensation by Fabian Rangel Jr. and Javier Caba, will be serialized beginning this coming June! Diego and Gabriel Soliz are two unusual brothers just trying to do their job in an even more unusual hometown. What's their job? They're detectives in a city populated by creatures from mythology and fantasy. 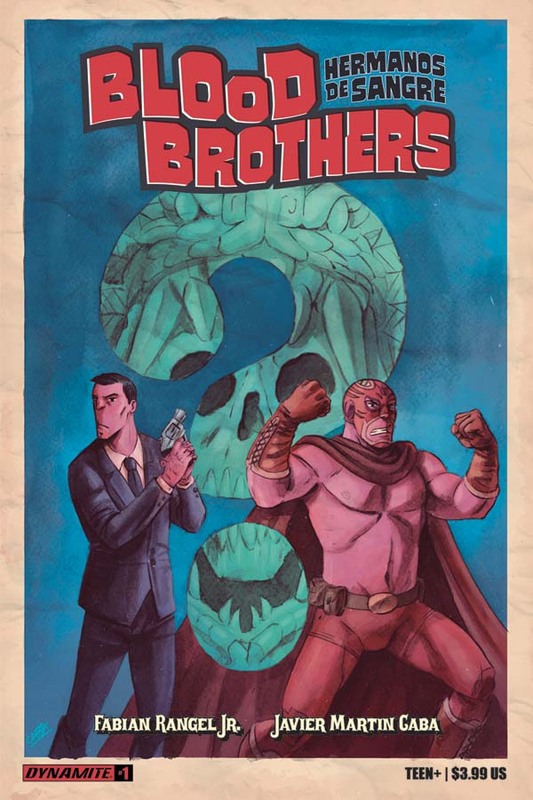 When an Aztec skull is stolen from the museum, the Blood Brothers are assigned to the case! Blood Brothers is a pulp-influenced supernatural tale with elements of fantasy, taking place in a world where the border between reality and mythology has been broken. 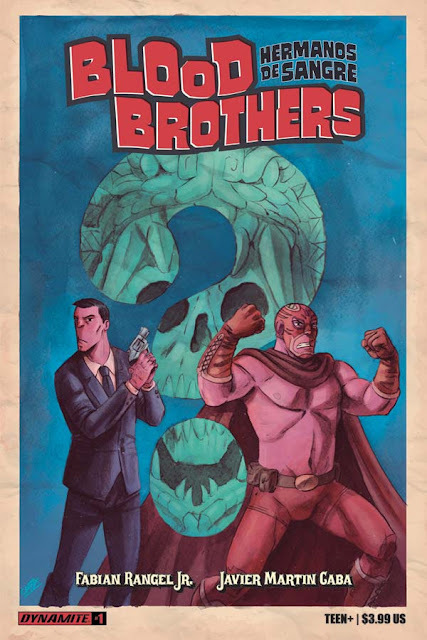 Writer Fabian Rangel, Jr. says, "Blood Brothers is the story of two Hermanos de Sangre: Diego, a hard-boiled detective who can communicate with ghosts, and Gabriel, a luchador whose skin glows in the dark when monsters are about to attack. Artist Javi Caba is doing tremendous character design work in the comic, creating a feast for the eyes. I had been wanting to return to the supernatural pulp genre, and Javi loves drawing fantasy stuff, so I figured why not put them together? 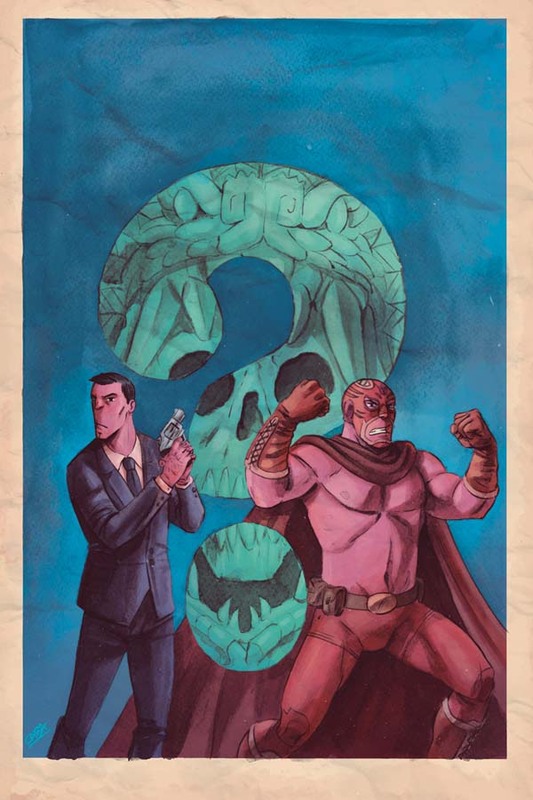 This series is for fans of Ray Harryhausen movies, comics like Powers, Hellboy, and Top Ten. I couldn't be more excited to be bringing Blood Brothers to Dynamite, the home of so many awesome pulp characters. They're the perfect home for this series. After a successful Kickstarter last year, I'm very glad we're getting an opportunity to reach even more readers through the Direct Market." "Blood Brothers is the comic that I'd like to read. Since the beginning, I was absorbed by the story and it was so easy to imagine this astonishing universe, full of monsters and cool characters," says artist Javier Caba. "I love drawing all of them because I can dip into all my pop background -- old-fashioned movies, novels, and EC Comics -- as well as let myself flow and create them from nothing." "Fabian and Javier's supernatural detective series is another perfect addition to Dynamite's growing line of crime comics, with an incredibly original take on the genre," says Dynamite CEO and Publisher, Nick Barrucci. "The story is fun, and the art perfectly illustrates a colorful world of the supernatural and fantasy unlike anything else on shelves right now." Blood Brothers will be solicited in Diamond Comic Distributors' April 2017 Previews catalog, the premier source of merchandise for the comic book specialty market, and slated for release in June. Comic book fans are encouraged to reserve copies of Blood Brothers with their local comic book retailers. Blood Brothers will also be available for individual customer purchase through digital platforms courtesy of Comixology, Dynamite Digital, iVerse, and Dark Horse Digital.